Real Deal Easy Homemade Holiday Almonds | Bake This Cake! We’re talking classic, home-roasted almonds here. Yep, the real deal. Intriguing, ancient, and modernly elegant. Just the way we like to roll. This is a fun DIY kitchen project that is super easy from start to finish. And when they’re all roasted up in your home oven and packed into adorable jars, somehow these healthy California beauties just get super-cool with that old-fashioned charm. We’re SO playing with almonds today! We’ll be blanching the almonds white in a quick and simple process, roasting them in the oven with a little oil and salt and loading up into cute little jars for holiday gifts. You might also like to save some batches for yourself (they freeze nicely in doubled-up, air-tight freezer bags). You can serve them as elegant snackies for your holiday guests. Or, if you save enough aside (don’t sell yourself short here), you could grind up some of these little darlings to use in a very special holiday dessert, like, oh, um, the completely amazing Italian Chocolate Almond Torte. Or maybe, bake an historic come-back cake with Mrs. Lincoln’s Vanilla Almond Pound Cake. That would be nice. You could also zing it up a bit by checking out our family secret for making Sweet and Salty Chocolate Holiday Nuts. Here’s a photo of the first roasting stage of that nut mix — for a big crowd! A nut is not a nut! What?? Yes, you heard me right. This little nut is actually not a true nut. But first, I think it would be good to check out the history of this delightful little fruit seed. I’ve done my homework on this little gem, and I think you might find it rather fascinating. What’s in a nutty name? Romans gave almonds as fertility gifts in the year 100 A.D. In Medieval Latin, almond meant “amorous“. Used in a sentence: “Honey, you feeling a little almond tonight, hmmm?” But I’m not sure how through the ages “nuts” became associated with loony, deranged or batty. If you’re a wordsmith or into “nutty” etymology, let me know your thoughts on this in the Comments. Maybe it’s because nuts are mysterious, complex and curious at the same time, or so bursting with flavor that the slang term became associated with “excessive” thinking. That’s the most my little brain can summon up on that score. I do happen to have a fun collection of nutcrackers and nut bowls on hand so if you want to come over to my house to crack some nuts with me, we can think all this over. The Long and Winding (Silk) Road of Almond History: Yes, these little darlins’ have a long and eventful culinary history. References to almonds appear in biblical literature and were discussed in the Holy Lands as far back as 2000 BC. Even Egyptian pharaohs enjoyed almonds in their breads. The Silk Road movement allowed for roving almonds between the Mediterranean and Asia and, by the 1700’s, the Spanish Franciscan Padres brought almonds to the California Coastlines. By 1870, California was producing a number of varieties of almond trees. 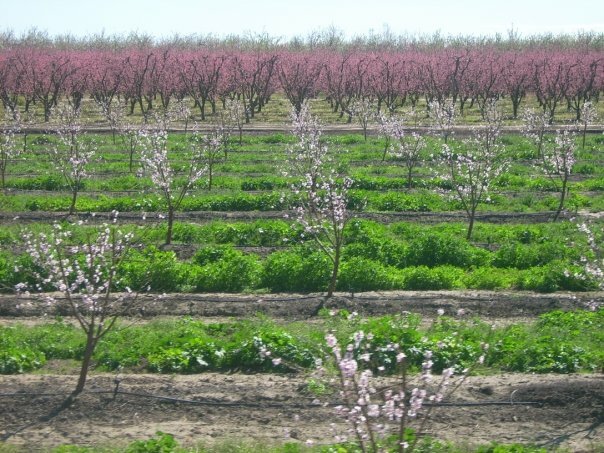 But by the turn of the Century, California’s Central Valley had become king of the almond orchards! Today’s California almond varieties include the historic Mission, Price, Carmel, and the most popular, Nonpareil, along with about 40 different varieties! Rich soil, mild climate and lots of sunshine! Not only does California produce almonds for nearly 100% of America’s demand for almonds, it supplies about 80% of the global demand. Whoa! That’d be a heck of a lot of almonds! And all this comes mostly from smaller, family owned farms that make up the majority of the 6,500 almond farms in California. Go California! Let’s get this thing straight: Tomato’s a Fruit, Almond’s a Seed: The almond is actually the pit of a single stone fruit, though we consider the almond pit (aka “seed kernel”) to be a “nut”. I guess it’s sort of like eating the dried pit of a cherry and calling the cherry pit a nut. I’m sure I was tested on almond facts when I was in the third grade — since they used to give the school kids in my hometown of Merced a farming test before you could advance to the fourth grade. I can still name walnut, almond, peach and apple trees by their leaves or their trunks. AND I’m proud to say that I can still I-D almost any California cow by sight. Just try quizzing me with a photo of a Guernsey, a Jersey or a Hereford, I dare you! Yep! All the orchard and ranching information a city lawyer will ever need to know! ha! 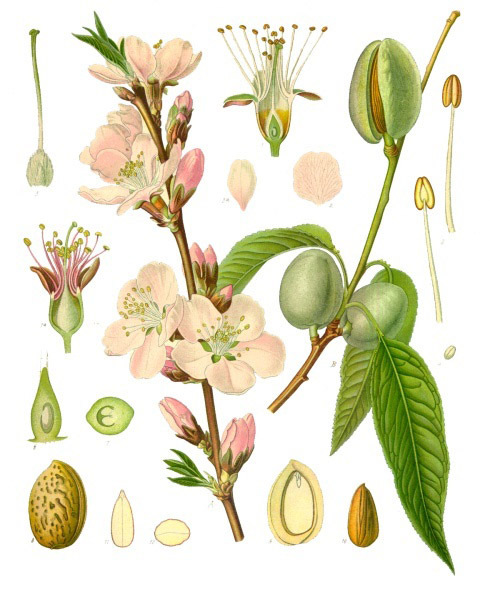 Peachy Kissin’ Cousins: Almonds are related to the peach and rose families of plants. In fact, I understand that most almond trees today are started by grafting them onto a peach rootstock in order to better resist pests. (See? I told you I was doing my homework.) BTW, America is the largest consumer of almonds, followed by China. (I’m on a fact-sheet roll now!) Almonds have no cholesterol (some studies show they can even reduce cholesterol), they contain the “good” unsaturated fat, are an excellent source of Vitamin E and magnesium and are a great source of protein, calcium and fiber. And, most importantly, you’ll always find some whole almonds in my briefcase because they remain my favorite afternoon office snack, assuming coffee is not considered a snack. Source: California Foundation for Agriculture in the Classroom (CFAITC) (except for my briefcase snack fact). The Delicate Almond Flower: Prunus dulcis blossom: Soft pink and white petals pop all over the almond trees during the bloom season. A breathtaking sight to behold IMHO. Almond petals usually start to bloom in early spring in California. Where I’m from, there are cool country events in the spring called Bloom Parties. These parties often involve good country cooking, great country music, lots of ranchers and farmers and interesting conversation — smack dab in the middle of an amazing blossoming almond orchard. Kind of like the awesome barbecues they put on at the end of a big cattle round-up (for cattle branding) — but without the gory branding part. Perhaps more in line with the Cherry Blossom Festivals (but on a country scale). BTW because these orchards are not self-pollinating, the almond growers need help from the famed honey bee to cross-pollinate the almond trees. This is one reason why almond growers in California are doing all they can to watch over and care for the tender honey bee with special management protocol to help the honey bees survive. The Almond Growing Process: After the flower petals drop, and the almond trees are full of leaves, fuzzy grey-green “hulls” sprout. 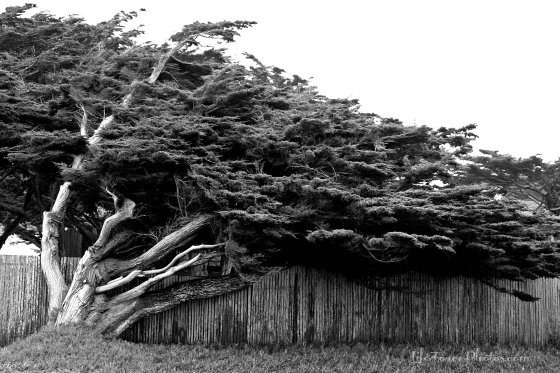 The hulls are the actual fruit of the tree. These fuzzy hulls cover the growing almond “shell” (that outer rough-textured husk aka “corrugated shell” (endocarp) that protects the seed kernels. The fuzzy hulls split open in mid-July. In the fall (between August and late October) the action begins big time when the hulls fully open. Extracting the Almond from the Tree: Almond shaker machines shake-shake-shake the almonds to the ground where they dry in place for 10 days. Then sweeper machines gather them into tidy rows to be scooped up for the processing plant to produce the “almond seed” aka “kernels” that we will soon be munching. Every part of the hull and shell will be used for various purposes so that there is no waste whatsoever. Here’s Your 1960’s Third Grade California Farm Test About Almonds: Now that you’ve read the above discussion about almonds, you’re ready to be tested! You can do this thing! Answer: Hull, shell (or corrugated shell or husk) and seed (or kernel or nut). Question #2: Can you describe the almond hull and its function? Answer: Green and grey fuzzy fruit of the tree that covers the shell and kernel. It forms in early spring after the blossoms fall and it splits in summer and fully opens on the tree in all. Question #3: What is the almond shell? Answer: Outer husk or corrugated shell (endocarp) covering the almond kernel. Here’s a photo of almonds in their shells. 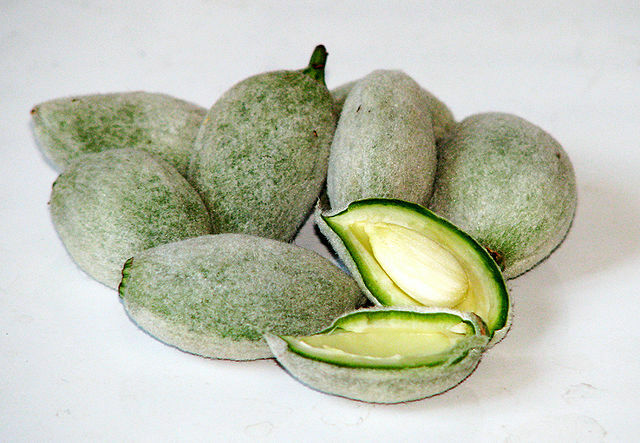 Friday Fun Note: It’s fun to throw these almonds-in-their-shells into a grilling wok over an outdoor fire or barbie. The teens and their friends used this nice pile of almonds to roast over the patio fire pit. The Friday Night Fire Roasting Project was so much fun for them (it somehow develops fascinating group conversation), they even cancelled their video gaming plans for the evening. Score one for the home hearth, zero for Super Smash Brothers. Answer: Thin brown seed coat that is removed when blanching to show the pearly white blanched almond seed. Question #5: What is an almond kernel? Answer: The fruit’s seed kernel that we eat and think of as the edible nut, even though it is not a true nut. Yum! Allergen Alert, Proper Handling and Storage: On a more serious note, almonds and other tree nuts are included on the FDA’s list of common allergens (peanuts, tree nuts, eggs, wheat, dairy products, soy, fish, shellfish (crustaceans)) — so be sure your holiday guests are nutty for nuts and do not have almond allergies before serving or gifting almonds. If you’re starting with truly raw non-pasteurized almonds, please take all precautions necessary to prevent bacterial contamination (by spoilage organisms or harmful bacteria). Tip: You could also skip the oil and dry roast these little darlings by lightly spraying them with water before salting (to help the salt adhere to the nuts). Double Tip: It’s easy to start small and work your way to a boat-load of home-roasted almonds. Remember, they freeze wonderfully for, like, a whole year (and they also re-freeze). We’ll grab up a load of nice whole shelled almonds. Yes, that would be skins on, shells off, you know the drill. Though, if you want to crack them from scratch, please do. We’re using 1 pound of Wonderful brand “Natural Raw Almonds” (presuming they are pasteurized since they come from California and are for retail sale, i.e. not purchased at a farmer’s market or purchased directly from the grower). Place an oven rack into center position and pre-heat your oven to 325 degrees. Place a large pot of water on the stove and get it roiling boiling. Gently slide the almonds into the boiling water for 1 minute. Tip: This 1-minute boil is actually plenty of time to loosen up their skins of the almonds. You will notice that the skins quickly become wrinkled (like the skin of your fingertips when you soak in the tub too long – when you were younger and you had lots of time on your hands to soak in a hot and bubbly tub for a very long time, sigh, okay, back to business here). Pour the boiling water containing the almonds through a colander set into the sink to drain off all water from the almonds. Let them cool for a minute so that they are not too hot to touch. Pinch the skins off the nut, one at a time. Just grab one up, squeeze the tip between your fingers and POP! The skin remains between your pinched fingers while the white nut shoots back into the colander. Cool! Voila! Perfect and quick blanched almonds! It took less than 5 minutes of pinch-and-shoot skin pop-offs to produce this batch. Rinse your lovely white almonds thoroughly and pat them dry with a clean cloth or paper towels. Transfer your little angels to a dry cookie sheet and dab them with a little bit (about 2 teaspoons) of Extra Virgin Olive Oil. Tip: I like dipping a silicone pastry brush into a shot glass or mini measuring cup of oil to pat them for the lightest coating of oil. Since they produce a little bit of their own oil, they don’t need much added oil. Sprinkle Kosher salt (about 1 teaspoon, or more to taste) over the batch and spread the almonds evenly over the pan. Double Tip: You could also try a specialty salt (my fave is called “Redmond Real Salt“, a natural salt from an ancient sea bed in Central Utah) but go a little easier on the quantity because this type of natural sea salt is more vibrant than a typical salt. Bake them at 325 degrees for about 15 minutes, but factor in stirring time. After baking for 5 minutes, open the oven and stir the almonds with a wooden spoon so that they are evenly roasted, ensuring that they remain spread fairly flat in the pan. Do this again at the 10 minute mark. Tip: Set the timer for the 5-minute stirring intervals because this is important to get your almonds all nicely and evenly roasted. Remove the almonds from the oven after they’ve baked for about 15 minutes or when they are just turning lightly golden brown as shown below. Double Tip: You will notice that the almond aroma will begin to waft into your kitchen. That heavenly scent is your signal to check the color for doneness. If you prefer a drier and crunchy texture, you may continue roasting your almonds for an additional 3 to 5 minutes. TIp: Sometimes I make a light golden and also a golden-golden batch and then mix them together. Cool your lovely roasted almonds in the pan for taste testing the salt ratio. Now’s the time to add a tiny kick of salt if you think that might be needed. You might need to sample a few morsels to get your taste buds in the correct posture for that subtle perfection salting. Tip: Remember, these are classical-style traditional almonds. They should be understated and sublime, not in the same vein as salty peanuts or a salted nut mix. Subtle salt perfection is our goal. After 2 to 3 hours cooling your babies uncovered on the counter, slip them into pretty wooden nut bowls to serve to guests. If you make a large quantity, spread the love by jarring them up in charming screw-top glass jars. Add a personal signature or personal note on the label. Make some extra jars for host and hostess gifts and New Years favors. Very small jars make perfect party favors. Here’s a showing of the lighter (more traditional classic) nuts on the left, with darker-golden (crunchy) nuts on the right. I like to give one to every guest to take home at the end of a special holiday dinner party. They make so many cute kitchen gift jars these days, you can really have fun with them. These almonds can be stored in jars in a cool and dark area for 1 to 2 weeks or in the refrigerator for up to 4 weeks or in the freezer well-sealed in an air-tight freezing container (or double bagged with air pressed out) for up to a year. You know you feel smarter already with all your third grader almond ag facts at hand. Now, are you ready to take on this old-fashioned kitchen project to bring home those flavors of history by going old school? You might even discover that there is a certain timeless magic in the aroma of fresh roasting almonds. So let’s do this thing — and then we can show the younger ones how to do it. This way we can pass forward one of the best traditional kitchen arts with home-roasted almonds. Join us next for a very special #cookieexchange holiday biscotti and a what? A very-vintage and rare holiday PIE recipe! Some scenes from my travels through downtown L.A., holiday palm trees and all! Can you tell me how to roast almonds in the shell? WOW that was interesting. You should be writing for Wikipedia. I had no idea the 2nd largest consumer of almonds was China. I wonder what they use them for or if they just eat them in their natural state. I think this is a great idea for Christmas gifts as well. Thanks!